Got this at the municipal IHOP, because it was the most sandwichy thing on the menu. It’s quite breakfasty, mostly on account of the scrambled eggs, but it was perfectly fine for dinner as well. That said, my review of the sandwich is decidedly mixed. 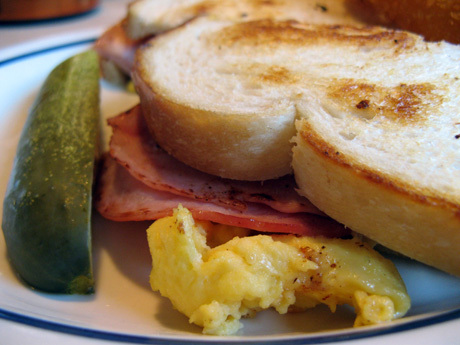 The combination of scrambled eggs and two kinds of melted cheese gave it a generally very goopy mouthfeel that the ham and bread did little to offset. Even worse, the bottom slice of toast was thoroughly soggy when it arrived, so it had clearly been sitting for a while before being brought out. Some of my complaints are directed towards the abstracted ideal of the sandwich, and some are directed towards the particular IHOP franchisee that served it to me, but it’s hard to tell exactly where to draw the line between them. The onion rings were fantastic, though.